Whilst the upcoming blog series looks at the future of work in 2023, our starting point for planning the future is digitising critical data today. If data is not digital, you can’t automate processes, you can’t analyse it leveraging digital tools, your employees cannot work flexibly without carrying home reams of paper and mobile technology may not go beyond a pen. Enhancing the technology we use today and preparing for the possibilities of tomorrow, Fuji Xerox is creating the future, not waiting for it to happen. Assess and optimise your current technology and data. Check if your current technology is stable, easy to use and can it be optimised. By optimising your office technology, you not only make it easy to manage but you may find cost savings which can be reinvested in more forward-thinking projects, including cloud integration. Integrate and automate simple processes. Multi-function devices already have the essential tools for digitising data (scan). More than that, most print/copy/scan devices have basic workflow capabilities to send data to email systems or cloud repositories. 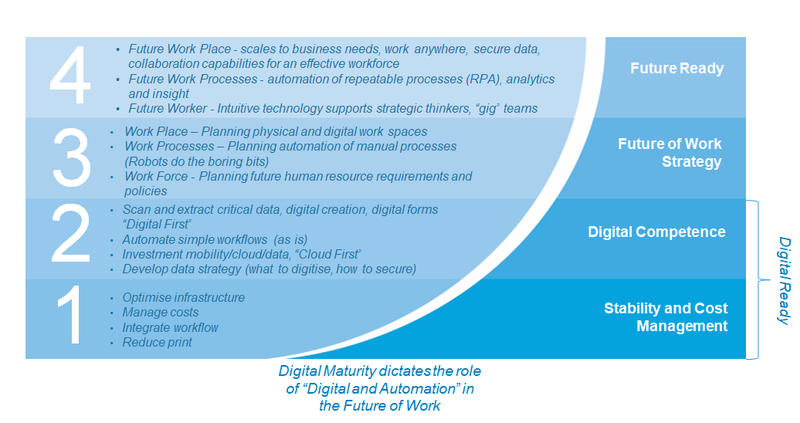 Once you have set off on the path to digital readiness, it’s time to contemplate how the next few years will impact your workplace, your work processes and your workers.